Around one hundred people gathered at The Mercantile Library to listen to Scott Huler, author of Defining The Wind, and Robert Off, miniature rooms creator, on a cold March night. Under the direction of John Faherty, the library regularly sponsors lectures by guest authors. Off called Faherty and suggested the collaboration. Huler, an author of six nonfiction books, wrote Defining the Wind, a story about Sir Francis Beaufort (1774 – 1857), an English naval hero, an hydrographer who charted the world for the British Empire and developed the Beaufort Scale, a written description of wind and sea conditions. The scale is still in use. Born in Cleveland in 1959, Huler knew the only thing he wanted to do was write. With a degree in English from Washington University, Huler became a copy editor in Philadelphia. He later worked forThe News & Observer, Raleigh, North Carolina and left in 1997 to write books full time. “It’s a strange way to make a living,” he said. 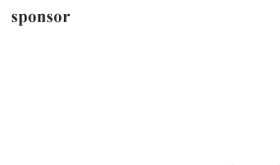 Huler spent a lot of time gathering information, as he was fascinated with the Beaufort Scale. Although he found the lack of a clean, narrative structure challenging, Huler published the book in 2004. Off, formerly a Cincinnati real estate broker, now makes miniature boxes (which he calls roomboxes) of the interiors of homes, individual rooms, usually, and markets and sells them. He views the boxes as an art form, educational aid or collectible for art enthusiasts. If it is art, a box is well made, interesting and transformative, according to Off. 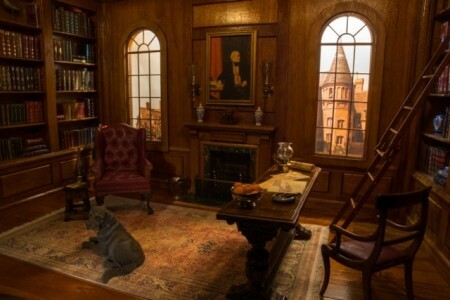 The roomboxes are influenced by stage sets/designs with their theatrical lighting, Surrealism, and Joseph Cornell’s miniature box worlds , which have become some of the most admired artworks of the twentieth century. 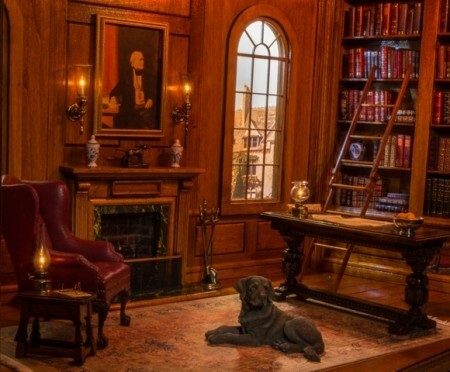 Off read Huler’s book about five years ago and was inspired to create a miniature room of what he thought Beaufort’s study would look like in England in the 1800’s. 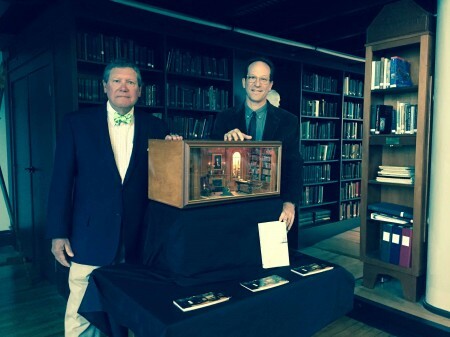 His box with a picture of Beaufort in the imaginary study was on display at the library. He is entering the box into a juried miniature show in Chicago from April 14 – 16. “I’m in it for the satisfaction,” said Off. “I did not think it would be a financial gain. The objects are emotions triggering your memory.” He has sold quite a few. The combination of a historical biography matched with a miniature study of the principal character makes a fascinating combination for those who like reading and art.